CCT program in Central Mindanao working well. The caption, Children covered by CCT program play outside their homes in the city of General Santos. KORONADAL, South Cotabato — The government’s conditional cash transfer program in the southern Philippines is working well in terms of improving lives of people in the region, government officials said. Zorahayda T. Taha, regional director for Department of Social Welfare and Development, said more than 213,000 households are currently covered by the program in Central Mindanao region since last month. “We are only covering children under 14 years old below but the government is planning to expand up to 18 years old,” Taha said. The Conditional Cash Transfer program provides direct education and health subsidies for families who comply with certain conditions, including regular school attendance for children and regular health center visits for mothers. Three children aged 14 and below are given 6.9 USD a month each while the mother receives 11.6 USD monthly for every family chosen to benefit under the CCT. “The Australian government review the program and it turn out working and helpful to the people,” she said. Taha was referring to Dr Tarcisio Castañeda, a consultant for Australian Aid who described the program “remarkable,” given that it is a young program that has already seen an increase in its budget and in the number of beneficiaries. The UN official, according to her, stressed that the program must be supported as it gives children of poor households a chance to finish school through incentives. Listahanan was successfully launched in Region XII on October 17, 2013. Spearheaded by the Department of Social Welfare and Development (DSWD) XII, the launching of the new brand name of what formerly known as National Household Targeting System for Poverty Reduction or NHTS-PR was initiated by Regional Director Bai Zorahayda T. Taha. Taha formally announced the new official brand name of the project during her speech for the agency’s first State of the Region Address (SORA) on Social Protection. Apart from the new brand name, new tagline “Talaan ng Pamilyang Nangangailangan” and new logo were also launched. Listahanan now as its new name is expected to reach more audience according to Taha. “The new name is derived from two Filipino words namely listahan (list) and tahanan (house/home) thus assumingly sounds more familiar to Filipinos, we are hopeful that it will eventually find its way to becoming a household term”, Taha explained. Accordingly, the brand as a whole balances authority/objectivity (scientific accuracy of list) with compassion (care and protection of poor) which is consistent with the image of DSWD. She further noted that NHTS-PR has merely changed its name to Listahanan however it still aims to identify who and where the poor are. Meanwhile, she announced for the plausible conduct of the second nationwide household assessment of Listahanan which will either be late this year or on the first quarter of 2014. It can be recalled that the first nationwide assessment was conducted in 2009 which identified a total of 296, 043 poor households in region XII. The result of which became the basis for targeting the beneficiaries of some of DSWD’s social protection programs, Pantawid Pamilya, Social Pension, Sustainable Livelihood Program and Government Internship Program (GIP) just to name a few. Taha urges the public and private groups, NGO’s, NGA’s and other groups to help alleviate poverty in the Philippines by using the Listahanan database as a basis for targeting the beneficiaries of their social protection services and programs. “Going through the process of inking a Memorandum of Agreement with DSWD to obtain the Listahanan database is worth doing as it can help you find the poor people who rightfully deserves your assistance minus the trouble”, Taha encourages. 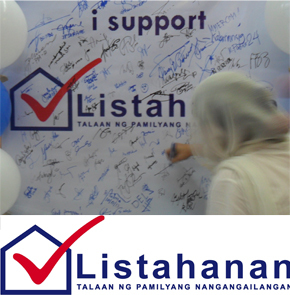 Currently, four other Government Agencies and three LGU’s have existing MOA with DSWD XII to use Listahanan database. Meanwhile, according to Regional Information Officer, Dennis G. Domingo II, the launching of Listahanan was deliberately scheduled as the day for the SORA to ensure huge crowd participation. “We took advantage of the number of audience during the SORA which consisted mainly of Regional Directors of different line agencies, Local Government officials, Social Welfare officers, private groups and our partner media”, Domingo noted. Flyers, Regional Profile of the Poor booklets, tarpaulins, FAQs and briefers were among the IEC Materials distributed during the launching. Audio-Video Presentation was also looped in the big screens. Generally, the launching was conducted to increase awareness, understanding, support and utilization of the Listahanan as the basis for household targeting of social protection programs. The Department of Social Welfare and Development (DSWD) XII conducted a Roll out Orientation Workshop on Social Protection and Development Reports (SPDR)/Risk and Vulnerability Assessment (RVA) to Local Government Unit representatives of North Cotabato Province held at Del Rio Splash Resort, Koronadal City in September 19-20, 2013. COLUMBIO, Sultan Kudarat— As the sun peeked from the mountains, casting its first rays on the small village of Maligaya, Julieto Marating, 48 years old and the B’laans’ community tribal chieftain, and his partner Elena knew that the morning was special, quite unlike the other Monday mornings they have seen. The sun’s steady rise revealed the village in a spirit of celebration, and not just because it was a beautiful day marked with birds singing and foliage kissed by dew drops and sunlight. Wide smiles appeared on Julieto and Elena’s faces as the sights and sounds of the festivities in the barangay proper filled their senses: bamboo arcs and banderitas (bunting) served as decorations, beats of agongs echoed from a distance, and different kinds of native food were laid out for guests. It was the 52nd anniversary of Maligaya, after all. For many, it was just their typical annual celebration. However, for Julieto, Elena and the rest of B’laan community, which comprise 35 percent of the total village population, it was even more special because for the first time, they will be the ones taking the center stage. Capping the village celebration was a milestone in the history of Sultan Kudarat- a mass wedding of 38 B’laan couples, including Julieto and Elena, who are all volunteers and beneficiaries of the Department of Social Welfare and Development (DSWD) programs. B’laan communities are usually in the farthest and most remote villages of Southern Mindanao. They are most known for their well-preserved rich and colorful cultural heritage, arts, and handcrafts, including brass ornaments and distinctive beadwork. Despite the richness of their culture and traditions, B’laans, like many Indigenous Peoples (IPs), are steeped in poverty and suffer from continuous deplacement from their lands. Julieto’s family settled in a mountainous remote sitio of Mauno, a five-kilometer journey from the Barangay Maligaya proper, traversing a near-impassable path. With fellow B’laan farmers, Julieto relied on the abundance of nature, planting corn, bananas, and root crops for sustenance and income. Trapped in a cycle of grinding poverty, for a long time, they were almost isolated from government programs and from the rest of the world. As he waited for the Fulong to officiate the mass wedding, Julieto, wearing his “saul laki”, a B’laan traditional men shirt made of abaca fibre, he recounted, “Murag me gipabay-an kaniadto, tungod nga naa kami sa mga bukid nagpuyo, tungod sa kalayo, halos dili me maabot ug makakita sa mga serbisyo sa gobyerno, kung naa man, halos pipila lang,” (Before, we felt we were left in the middle of nowhere because of the distance. We have limited access to government services). To make matters worse, Julieto and the rest of B’laans had to face discrimination and deception. “Kung manaug me gikan sa bukid arun magbaligya sa amoang mga produkto, ang uban sa amo kay dili gani kabalu mu-ihap, tungod kay nubo among tinun-an, sugot na lang kung pila ihatag sa manugpalit ug sila pud nagapresyo,” (Because some of us are illiterate, and don’t even know basic numeracy, if we had to go down from the mountain to sell our agricultural products, the one buying the product had control over the price, and we do not know that if the amount given was right],” Julieto sadly said as he fixed his salwal (trouser). Julieto was a Grade III dropout. For Julieto, their voices crying out about their problems and struggles just kept echoing in their mountain, never getting out, giving them no chance of getting heard by those not from their community, and they felt that the small number of those who heard their plight chose not to listen to them. Though there were several interventions given to them before, it was when the DSWD entered Columbio that the B’laans felt that they were finally heard, and they enthusiastically jumped in to participate in these initiatives. DSWD worked hand in hand with the local government of Columbio and the community to implement the Kapit-Bisig Laban sa Kahirapan-Comprehensive and Integrated Delivery of Social Services (Kalahi-CIDSS), a community driven-development strategy in reducing poverty, improving local governance and empowering community by way of getting the citizenry to become involved throughout the process. Inspired by the staffs who endured trekking mountains to reach their community, trying their best to involve them in village assemblies and planning, without undermining their capacities, Julieto was one among those who first showed support to the program. Despite being the tribal chieftain, Julieto was hard-pressed to convince the B’laans to become involved in Kalahi-CIDSS. “Sa una, lisud kaayo dalhon ako ang mga katribu kay ilahang priyoridad mao ang makakaon kaysa sa mag adto sa mga assemblies,” (First, it was difficult to convince my tribe to support the program because their main priority is livelihood and not attending assemblies), Julieto said. However, Julieto remembered happily how he convinced his tribe to forego a portion of their times usually used for livelihood for the Project, even if it sometimes meant walking a long distance to attend activities. He used the “sense of ownership” value as driving force to maximize support Kalahi-CIDSS. Little by little, they learned to love it, prioritizing it in their list of activities. Indeed, their efforts had been paid off. Maligaya, with the collaborative efforts of all villagers, was able to construct a day care center, their chosen community project. The B’laans fully supported the Project for they believed that education is the best way to break the cycle of poverty, given their experiences. The following year, B’laans were able to achieve yet another dream through Kalahi-CIDSS, a post-harvest facility. The community united in assemblies to plan for their solar dryer community project, which they constructed right in the middle of the village, chosen so they can increase the quality of their agricultural products and their income. The increase in income allowed Elena to put food on their table for their family. However, this left them with almost nothing for the health and education needs for their three children. Luckily, their family was included as one of the partner beneficiaries of Pantawid Pamilyang Pilipino Program (Pantawid), a conditional cash transfer program of the Philippine government also implemented by the DSWD. Through Pantawid, Elena was able to send her three children to school, all of whom are covered by the program. The P1, 400.00 Elena receives each month has been a big help for Elena to sustain education and health needs of their children. The money they usually tried to set aside for education is now used by Julieto and Elena in their other livelihood activities. They were able to raise more domestic animals such as chickens, ducks, and pigs. They have also increased their agricultural inputs, thereby increasing also their income. While the financial aid has greatly helped their family, what’s more important to Elena are the valuable lessons she learned by attending Pantawid’s Family Development Sessions such as enhancing family relationships, responsible parenthood, community participation, and leadership. While Julieto keeps himself busy in Kalahi-CIDSS, Elena, as Parent Leader, helps in improving the implementation of Pantawid Pamilya by ensuring that B’laans in their community are complying the conditions of the program. “Ang programa sa DSWD amo gyud gimahal ug parti na sa among kabuhi, kami ang naningkamot ini busa amoa kini kay mao ni ang among gipaabot sa kadugay na nga panahon,” (We have embedded in our lives and love the DSWD programs. We regard these as our own that is why we want these to become successful, because these are what we are waiting for a long time)”, Elena said, who wore a colorful an elegant embroidered B’laan wedding dress. The agong beats reverberated in the ears of everyone, signaling the start of the community wedding. The bright shimmering sun complemented the smiles and emotions of the soon to be husbands and wives. All of them are beneficiaries of Pantawid Pamilya Program who were collaboratively convinced by Julieto, barangay officials lead by Barangay Captain , DSWD staffs and local government officials to take the marriage vow. The first in line were Julieto and Elena. While sitting on a mat, they fed each other rice and a boiled egg from a single plate, which symbolized oneness. A strand of hair on the head of Elena was then knotted together with a strand of hair from Juieto, symbolizing fidelity and faithfulness. While Elena knelt on a pillow, Julieto stood up and applied pressure to Elena’s shoulder with his knee, symbolizing her submission to him. Elena then performed the same task on Julieto’s shoulder. After the wedding ceremony, the largest wedding gift the B’laans received was finally unveiled. They were ushered to nearby building to witness the turnover of another Kalahi-CIDSS Project, a one unit 7m x 10.5m warehouse facility that the DSWD, LGU, local officials, B’laans and the rest of the community had collaboratively worked together. For newly wed Julieto and Elena, however, the true gift that has given to them is the recognition of their contributions to the development efforts of the community. The perception that they are like idle people in the mountains; without use, without skills, without ideas, now slowly vanishing. Now, Blaans prove that they can drive their own development; they are not just an audience but rather actors of development. They were given the access to and control of key development decisions and resources. Through these, their village was significantly united and empowered without compromising their cultures and traditions, allowing them to retain their existence and identity as B’laans. “Nakabalo ug nabatyagan namu nga kami ginarespeto ug ginakilala na kami bilang tao,” (In our hearts, we know and we feel that we are recognized and accepted as persons),” Julieto said, while holding the hands of his now officially called wife. While having lived together for more than 12 years already, this was the first time they were officially married. KORONADAL CITY—The Department of Social Welfare and Development in Region-12 has recently completed the one-unit-two-classroom school building in Kolambog, Isulan Sultan Kudarat, an agency official reported Thursday. DSWD-12 regional director Bai Zorahayda T. Taha said that a school building amounting to P 1,299,823.00 was built through one of the government’s flagship anti-poverty programs, Kapit-Bisig Laban sa Kahirapan: Comprehensive and Integrated Delivery of Social Services. The newly built classroom greeted hundreds of eager young learners of Kolambog Elementary School, answering the perennial problems of dilapidated, overcrowded and makeshift learning facilities, as new school year kicked off recently. Kolambog Elementary School pupils will no longer jostle for space with the newly built school building, providing conducive learning environment for young eager learners and is expected help improve the quality of education of the school. The said school building is the first completed project in the region financed by Australian Agency for International Development or AusAID. The AusAID forged partnership to the DSWD by funding proposed school buildings and day care centers in the country through Kalahi-CIDSS Program. In Region-12, AusAID will be funding a total of 35 school building projects and seven day care centers in forty (40) remote villages amounting to P62.21 million. These projects are expected to be completed before the year ends. Koronadal City, SOUTH COTABATO—Department of Social Welfare and Development (DSWD) Secretary Corazon “Dinky” Juliano-Soliman paid visit community projects in Southern Philippines recently and lauded the contributions of volunteers and various stakeholders as part of collaborative efforts of the agency to reduce poverty in the countryside. Soliman visited newly completed foreign-funded projects in Isulan, Sultan Kudarat, constructed through one of the three poverty reduction programs of the agency, Kapit-Bisig Laban sa Kahirapan-Comprehensive and Integrated Delivery of Social Services more widely known as Kalahi-CIDSS. “Kung hindi nakiisa ang lokal na pamahalaan at mga community volunteers hindi tayo makapagpatayo ng mga proyektong ito,” (If the local government unit and the volunteers did not work together, we would not have been able to construct these projects), Soliman said. The DSWD head appreciated the contributions of community volunteers in charting local development directions, playing direct role in implementing key project activities at the community and municipal level. Soliman interacted with the volunteers and beneficiaries of Barangay D. Lotilla during her visit. Residents in the village had to endure using discolored, smelly water because they had no other source of potable water. It also monitored 15 cases of amoebiasis, diarrhea, and other water-borne diseases. Through series of consultations with Kalahi-CIDSS, the villagers identified the need for potable water as their most pressing concern. As such, they proposed the construction of a water purifying station, which was subsequently approved. “Our community project aims not just to provide access to potable water service to all households of the target sitios, but also to provide entrepreneurial opportunities and increase the local revenues,” Ricky Fuentespina, one of the Kalahi-CIDSS volunteers, said. In less than three months, the villagers’ long awaited project started to unfold before their eyes. The community project cost P846, 638.00, of which, P144, 871.00 came from the local community counterpart contribution, in cash and in-kind. The remaining P701, 767.00 came from the DSWD grant to Barangay D. Lotilla. Meanwhile, DSWD Regional Director Bai Zorahayda said that the community project will benefit hundereds of residents in D. Lotilla and neighboring barangays. “The project will benefit at least 718 households, in which thus community project is the first ever and currently the only water purifying community project in the country constructed through Kalahi-CIDSS since the project started in 2003,” Taha said in a statement. The Department of Social Welfare and Development XII is now preparing for the next cycle of the National Household Targeting System for Poverty Reduction (NHTS-PR) assessment this year. “Part of the preparation is the recruitment of National Household Targeting Unit (NHTU) staff which is expected this month of July”, said DSWD Regional Director Bai Zorahayda Taha. Vacant positions include Area Coordinators (AC), Encoders and Verifiers, Area Supervisors (AS) and Enumerators (Ens), “As soon as we get hold of the Authority to hire, we will start short listing competitive applicants for the vacant positions” Taha said. Meanwhile, Jackiya A. Lao, concurrent NHTU Head noted that the short listing will be done with the help of groups such as the academe. “We will make sure that those who will be hired have the initiative to learn and contribute to the success of the project” Lao noted. Accordingly, applicants included in the short list endorsed by the National Statistics Office XII shall be prioritized for the second round of assessment. “The short listing is being done to ensure that only socially responsible individuals get to take part in selecting the real poor”, Lao explained. NHTS-PR assessment is conducted every four years to identify who and where the real poor households are in the country. The database will be used by Government Agencies (GA’s), Non- Government Organizations (NGO’s) and Civil Society Organizations (CSO’s) in choosing the beneficiaries for their anti-poverty programs and services. GENERAL SANTOS CITY – The Department of Social Welfare and Development field office 12 recently spearheaded the CICL profiling and data matching Thursday, here in a bid to review and sanitize data of Children in Conflict with the Law (CICL) both of PNP and local social welfare offices regionwide. Representatives of local PNP and social welfare offices sat down and presented their existing data on CICL since 2006 and compared the data. Naira Aratuc, chief of DSWD community-based unit said that the matched data will ensure the correctness and accuracy of CICL information. “We used a uniform template for each municipality in order to have an organized information as well as reports because soon, the regional office will require the regular submission of said document,” Aratuc explained. Mary Jane Martha Gabucan, social welfare officer of Koronadal City shared their best practices during the activity and encouraged colleagues to innovate initiatives like using forms or separate logbook exclusive only for CICL, to identify the case number. “This coordination with our PNP led to easier tracking of CICL data,” she said. Gabucan also shared the joint monthly updating of CICL data in order to avoid confusion and ensure organization of information. “When we know the status of our CICL, we can always remind ourselves in ensuring the progress of the case and consequently help fast track the processing of the cases,” Gabucan said.